The Hotel Akaretta is a beautifully restored Basque farmhouse that was featured in the movie “The Way” in the scene where Martin Sheen’s character joins Pilgrims at a table outside for dinner. 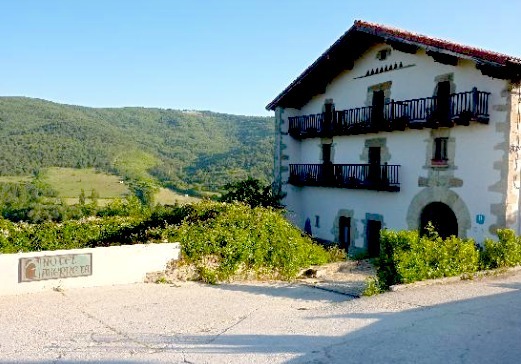 The farmhouse called Sastrearena, a typical Basque ‘caserio’ of the Pyrenees, was built in 1723 and has been catalogued for its historical and architectural interest. It is a great place to stay and aside from it’s wonderful rooms it serves food fresh from the garden. The stone-wall house still conserves its original Pyrenees-style kitchen and its bread oven. The enormous oak wood beams, webbed to create the structure of the house, reveal the historical origins of the homestead.